When I was a kid I completed all my video games I owned. Obtaining 101% in games was no problem, and if there were achievements back then I would be the king of them. As a kid I had no responsibilities but go to school, get good grades, and stay out of trouble. So what else was I going to do but play video games all day long. But the main reason why I completed all my games is because I didn't have many to begin with. The only money I had was a small allowance I got on a weekly basis; and two dollars a week meant it was going to be a long time before I bought my next game. My parents had all the purchasing power, which meant I usually only got new video games on my birthday and Christmas. If I did well in school I would get rewarded with a new game or two. But because I was getting a few games a year, I played them over and over again and 100% most of my games. Around junior high my allowance started getting a bit better, and by early high school I was saving all my allowance to get about a game a month. I still had a lot of time on my hands to be playing every game to it's fullest and pick up a new one every month. I became a completionist out of necessity. It wasn't until late high school where I got my first job and my first paycheck, that I was to buy games whenever I wanted. Now I had all the money! And I could buy all the games! I think for the first year I had a job, 90% of it went to video games and video game related purchases. Games, systems, guides, a new TV, extra controllers, limited edition stuff, classic games, I never got for Christmas; it was all mine! I had no idea my impulsive buying habits I developed when I got my first job would stay with me for a long time. It isn't until recently that I can say it's gotten better. If only by a little bit. If I had sat down and set a budget for myself when I got my first job, I probably would not have had a bunch of the financial issues I did, not just with games but in my personal life. But I was seventeen! What seventeen year old knows the importance of a budget? The hardest thing about saving money is not spending it. Having to tell yourself, "You don't really need this right now," over and over is one of the most challenging things to do. Which is why we break those promises over and over. Even when I first started buying every game in front of me I had a few moments where I would look at all my new games and wonder, "when am I going to play all these games?" But I didn't let those moments of self reflection stop me. And I think that the games of today have tons of more hours you can put into them than the games I had when I was growing up. It doesn't take too long to 100% Super Mario World. This is why when I completed a game I would usually delete the save file and do it again. I don't know how many times I did that with games like Super Mario World or Donkey Kong Country or Ocarina of Time but I did it so much that I still remember where every thing is today and can go back and complete everything from memory. If I had a game like Skyrim or Borderlands 2 or Halo 4 as a kid, I probably would not have even noticed I was getting like 5 games a year. I would say it would have been when the late PS2, Xbox and Gamecube games started getting released, that games stated having a lot more things you could do in them, meaning if you wanted to actually 100% a game before the next one, it was going to take you longer and waiting to hold off on purchasing that shiny new game became harder. Because even though the games got longer, game releases stayed the same, or were more frequent in some cases. Eventually I got older and had more responsibilities in my personal life and that started taking away all the free time I had to play video games. Unfortunately I was still buying video games like I had all the time to play them and I didn't. It's easy to look back and notice these issues which are obvious now, but when it's happening in the moment you might not realize it. And even if you do briefly acknowledge it or are aware of your reckless decisions causing a bad habit to form, you have to be willing to solve it right there and not put it off thinking it will work itself out. Many times I justified my purchases of multiple games by telling myself I will play them later or more time will magically make itself available. But that doesn't happen. In fact, the opposite always happens and you always have less time to play games as you get older and get a job, get married, have kids, etc. I'm sure my story isn't dissimilar from others. We can't control our purchases which is why we all have a huge backlog. So what is the solution? The one thing I'm going to start with this year to help me tackle my backlog is to budget. Now a few things about having a budget should be discussed. The first being I should not try to max out my budget by the end of the year. I have $520 to spend, my goal isn't to spend every single cent, but to use it as a guide so my purchases don't get out of control. Even though I have this money I know I can spend, I still need to make sure every purchase matters and is a smart buy. If I tell myself to just buy every game at $10 or less that would be 52 games, and there is no way I am going to play 52 games this year. The second is there should be a consequence for going over my budget. How am I suppose to form a positive habit if I have nothing to keep me from breaking it? I can say I should only spend $520, but if by the end of the year I spend over $200 of my budget, is there anyone that's going to hold me accountable? I only have myself to. So, at least for the foreseeable future, let's say next year's budget will be the same. If I do go over budget than that will be taken away from next year, and I'll have less money to spend. This would be good because if I am not careful I can spend all my money for the next two or three years! But hopefully it won't come to that... right? I didn't really know how much I should spend on video games or what my budget should be, so I decided to make things simple. There are fifty two weeks in the year, and at most I shouldn't be spending more than ten dollars a week on video games. So that's how I came up with $520. When I hear $15 a week or $20 a week it sounds like way too much to spending for my budget. But if you are someone who can spend well beyond $10 a week and still live comfortably within your means, go ahead! Find whatever number works well for you. I'm not rich, and my bank account cries a little whenever I take any amount of money from it. What counts towards the budget? Everything and anything video game related goes into the gaming budget. I'm talking video games, controllers, accessories, strategy guides, consoles, etc. Something that's another form of media like a DVD or Book that's not a strategy guide, doesn't count. So for example the Hyrule Historia I bought last year, doesn't count to my budget. I used gift card money to buy it anyway so win win. There are a few purchases I know I will be making through out the year that I should add to my budget right away. Even if I don't end up making them, I will still have the money for them in the budget and help prevent overspending. Last year I started my $60 Steam sale budget, and I'll create another post detailing what that is. Basically I am only going to buy games from Steam twice a year, during the Steam Summer Sale and Holiday sale. I can only spend no more than $60 each sale. Also I will need to renew my Xbox Live membership at the end of the year, so that's another $60. Although I usually grab it at a discount but still if I miss that I know I have the $60 for it. There are two big ticket items I would like to get this year. The first is Pokemon X&Y. Now these purchases are not set in stone, because there are a few factors that need to happen for me to get them. I outlined what I need to do in order to get X&Y in my blog about Pokemon this week. What I would like to add to that is if by some reason I take a really long time and Pokemon Z or something is announced this year (which if history shows is a very good possibility, maybe even an announcement of a remake of Gen III) then I will hold off and get that version instead of X&Y. The third extension of each series usually combines the best elements of the two games, and adds updates and features that affect competitive play. So for me to stay up to date with Pokemon I would have to get that version. The other big ticket purchase I want to make this year is the Wii U. A while back I made a few rules for myself so that I would not buy consoles when they launched, and I'm going to create a post detailing what those rules are. But the Wii U is almost, almost ready for me to buy and if all goes well, this is the year I can do it. But there is one big factor: Super Smash Bros. I've decided that I will not buy a Wii U, even if all other requirements are met, until Super Smash Bros is available. And by available I mean in stores or on the Nintendo E-Shop. I am tired of buying systems for a game I want, and end up waiting a year or two for a game that was announced. Then by the time the game comes out there is a nice bundle or limited edition set I could have purchased instead of the vanilla model. The first year the 3DS came out, they had that sweet Ocarina of Time bundle, which I really wanted. But I told myself I would be better off waiting. And I am glad I did because then we got the 3DS XL redesign and another Zelda bundle with a new Zelda game, rather than a game I've played 100 times (to be fair would still play it 100 times more). And I wish I would have bought a DS XL back in the day because comparing my 3DS XL to my DSi, I can't go back to the smaller size. Bigger is better in this scenario. So who knows what will happen with the Wii U by the time Smash Bros is eventually released. 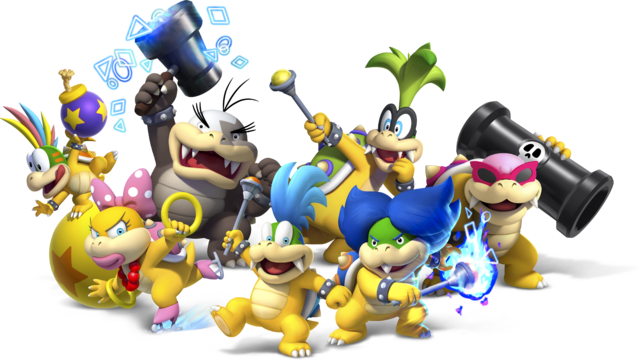 Both Melee and Brawl were delayed, and Nintendo already delayed a few Wii U games like Donkey Kong Country Tropical Freeze. 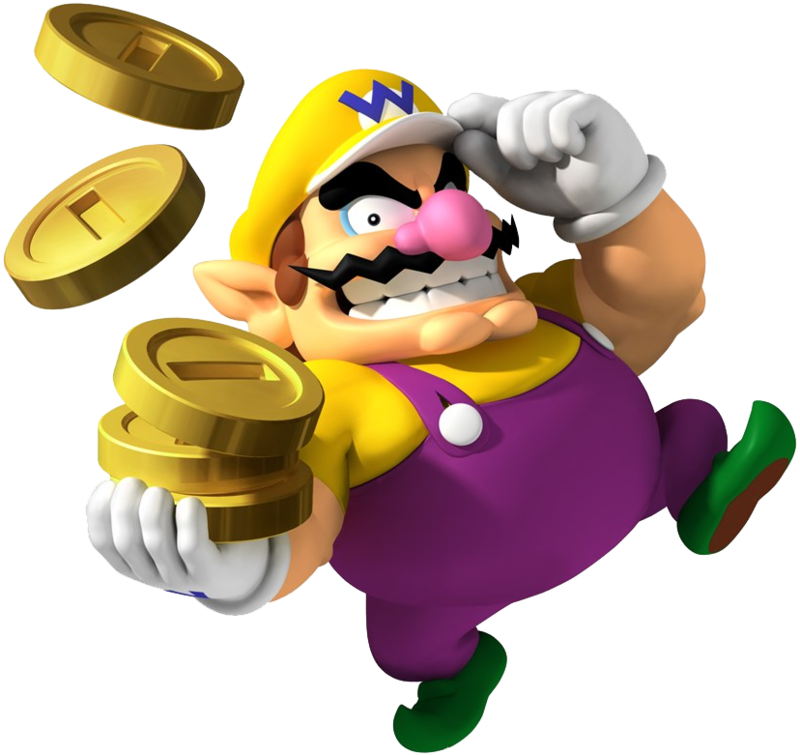 I don't want to buy a Wii U mid year when I could have waited until the Fall for that super sweet Smash Bros bundle or maybe there will be a price drop to help struggling sales. But I will go into more about my mindset of purchasing new systems, and create a timeline of when I would like to get each system I want. How do I keep track of my budget? Every time I make a purchase, I will put it into a Google Docs spreadsheet. I will put what I purchased, the date, how much it cost, and if it was a sale or discount and how much it's original price was. This is the easiest part of keeping my budget. Once I figure out how to share my google spreadsheet (and make it pretty) I will put it up in a future post, and post a blog every time I make changes or add to it. There are a lot of things I want to buy. This is something I will admit is probably one of the main reasons why I spend so much on games. Not just new games, but old classic games I use to own that I want to rebuild my collection. I find myself looking on Ebay for hours at potential great deals on games and purchase them, telling myself I'm adding to the collection I always wanted. Yet I don't keep track of what I spend and sometimes the purchases just sit there for months without me even touching them. I think I get more satisfaction buying something I use to have than playing it. Hopefully by keeping a budget I can change all of this. I will have to be smarter about my purchases through out the year, therefore I will be spending my money on the things that (should) matter most to me. There are a lot of collections I want to build, but some of them I won't be able to enjoy in my current situation. I need to be realistic about my purchases, and think long and hard about each decision I make. By keeping my budget I will be a better gamer because I will be a more financially conscious buyer. I will be a better Dad as well; teaching my daughter the importance of a budget when she gets old enough and hopefully preventing her from making the same amount of mistakes as I did. I will be better at budgeting in general if I pull this off, and who knows maybe by the end of the year I will have a surplus, and be in a position to make larger purchases in the future. Ok so let's go out there, not spend any money, and play those games I own! Watch out Ray Rizzo, there's a new champion in town. Okay so maybe I'm not an official champion by Pokemon Play standards, but last night (or 1 a.m. this morning) I finally won the Champions tournament at the PWT in Pokemon Black 2! Also, I'm 27 years old. Quick editor's note: that pic up above isn't mine...it's something I grabbed from online. I wanted to take a picture of the moment when it did happen, but it happened so suddenly I forgot. I achieved this victory of victories late last night, lying in bed, wife already asleep, my hunger for victory keeping me awake. I didn't think I was going to win. I kept losing over and over and I was only playing because I couldn't believe that my hard work to build a team to defeat the champions tournament wasn't working. Well, I could believe it, because it actually wasn't my fully realized team, I just was trying to rush a team I had been building the past few days and testing how far off I was. My journey to this point started a week or so ago, when I started playing Pokemon Black 2 again. I picked up the game this past summer, with some gift card money I had received for my birthday. I conceded to buying it because I thought I was going to get a 3DS and the next Pokemon game far into Summer 2014, so I figured I'd entertain myself with Black 2 for awhile. And I did play it, putting in my usual 100 plus hours like I do every Pokemon game. I stopped playing it maybe around the Fall, and hadn't touched it until recently. So why did I decide to play it again? As with all my games in my backlog, I had some unfinished business. I have been playing Pokemon consistently since Red/Blue. I begged my mom to get me a copy of the game when it first came out, and while everyone walked around with their fancy Game Boy Pockets, I was dishing out Ice Beam's with my Articuno on my big fat grey Game Boy OG. Like a gangsta. And I bought every Pokemon game since when they were first released up until Black version 2. I was playing Gold with it's night and day cycles while 90% of my friends abandoned Pokemon altogether. By the time Crystal came out, I had stopped watching the show but not catching them all. Sapphire practically changed my life, and to this day it's one of my favorite entries of the series. I bought Emerald too, but never really touched it because I had 500+ hours on Sapphire (wish I still had that cartridge, but more on that later). Of course I was gonna revisit Kanto with Leaf Green. And even though I always had to defend myself to people when they asked, "You still play Pokemon?" when Diamond and Platinum dropped, it's been the only franchise I've stayed with consistently and bought every single entry. It's my favorite franchise, and one that I know I will never get tired of. So of course you can imagine my excitement when I got my hands on the greatest remake of the greatest game of the series (at that point) Heart Gold. Me and Pokemon, we've been friends for life. Pokemon B&W 2 was the first time I didn't buy a new Pokemon game right when it was first released. Why? Because I thought I'd hold out for the soon to be announced new Pokemon game to be released on the 3DS. And sure enough my prediction was right, and X&Y was announced. But times were rough, and realistically I knew I shouldn't drop money on the 3DS right when it came out so that I could get Pokemon when it drops. I'd figured I'd wait until Pokemon came out, then buy them together, hopefully as a bundle. But that's not my secret. The reason I've started this blog is because I want to create better habits for myself with my most passionate hobby. And sometimes that means I have to come face to face with the bad habits I have, and be honest with myself about what I am actually doing, and what I need to be doing. Pokemon is a prime example of how dedicated I've been about gaming since I was a kid. It's not the only game or series I've stuck with, but it's most likely the one that I've logged the most hours into combined. In fact I wish I did have all my old Pokemon games so I could add up the hundreds of hours I've logged in. Unfortunately there have been some rough financial moments in my life that have forced me to sell some of my most prized possessions. And as much as I didn't want to, I've had to sell a lot of my games and systems I've owned throughout the years, Pokemon included. Little by little my collection was sold, and my Pokemon games were the last to go. I sold off everything I had from Red/Blue/Yellow to my Pearl and Platinum. Along with some of my older GBA's and other Game Boy's. And just like that, all my Pokemon, all the hours I had poured into the story and catching them all (yes, I did catch them all a few times), the endless breeding, shiny Pokemon I found, special Pokemon events like the ones in Time Square I went to, literally hundreds if not thousands of hours were gone. Yes you will always have your memories when something like this happens, but as much as I fondly remember all the years I spent playing, I can't get rid of the dark cloud that hangs over me when I play Pokemon. What I once had, maybe possibly what I could have kept, is gone. And I can't get it back. But this is why we fall, right Bruce? We need to live and learn from our past failures and mistakes. For a time I was in such a depressive state even when I left NYC, that I kept going back and forth on how I was going to recover. I started spending money on old games I found at garage sales in an attempt to reclaim what was once mine (and probably spurring someone else getting rid of their game collection into a similar state). I was spending money I didn't have and shouldn't have been spending. I would take these games and then sell them again, because we hadn't really established our living situation, and I was foolish to make those purchases in the first place. I was in denial of what was happening with my relationship with video games. Even when things started to look up for us (we found an apartment, I got a full time job, we got a car, etc); I was scared about what was going to happen with me and my games. I was afraid that every game I purchased I would sell, end up regretting it, buy it back, sell it, rinse, repeat. And it was hard for me to stop doing so. Video games and I have been together since I was born, it's a part of who I am. I've never valued it above my wife or kids, which is why I made the hard decisions I had to make, but I would be lying if I said it didn't hurt me and still does. And Pokemon has always been at the center of it all. If there is one series that reminds me of the amount of hours that I put into it, and now have nothing to show for it, it's Pokemon. I wanted to be there at those Pokemon Play regional tournaments and compete. Battling online and getting a chance to put years of experience to the test. But by the time all these things became available, something I've always dreamed of, I had lost it all. I have nothing to show for the work I put into these games, and that is scary. A week ago I started playing Black 2 again, as I said, because there was unfinished business. Not just within the game, but with recovering all that time and energy I've put into this series. Last year I started to buy all my games digitally, as one of the preventive measures I've taken to ensure I can never sell games and feel regret. I have to make sure not to sell the systems to play them, but I (hopefully) won't let that happen. Having the 3DS and the digital downloads available is a blessing, because for the first time ever, I won't be able to lose all the Pokemon and hard work I've put into it, because I'll be able to back up my game saves on my computer, and store my Pokemon in Pokemon Bank, and keep the game forever digitally. Now that I have a 3DS, I should download Pokemon X&Y right? I mean what am I waiting for? Well, not so fast. Yes, if there is any game that I should jump on it right away, Pokemon would be it. But even though I do have the money, and the dark times are a lot brighter now, I need to be very careful and patient with my game purchases. I bought Black 2 with every expectation that I wouldn't be getting a 3DS until this summer. Now that has changed and I do own a 3DS yet I don't want to leave Black 2 unfinished. I want to go into X&Y strong and confident that I am making my return and fixing my past mistakes. This year I have a game budget, but I also want to set some criteria for certain purchases through the year, so I can ensure I don't exceed my budget or spend it all too quickly. I need to treat my budget as a benchmark, and as I learned in real life I shouldn't be maxing out my budget either. So the longer I take between game purchases the better off I will be in the long run. Here's a list of goals I want to achieve before I get to Pokemon X&Y. Gotta Catch 'em all - When I had Platinum, I was able to transfer all the Pokemon I had up until that point and I did indeed have a fully completed National Pokedex, including all the event Pokemon like Mew, Celebi, Deoxys, etc. I know it will probably be a long while before I get those event Pokemon again, but I would like to go into X&Y with a full national Pokedex. This means I might even have to obtain a few of the older games like Heart Gold and Platinum. Defeat 100 trainers in a row at the Battle Subway Super Doubles Line - What to do after I catch them all? Why, battle of course! The closest I've ever reached to getting a hundred in a row was back in Emerald at the Battle Tower. My team of Heracross, Regice, and Salamence was this close before getting wiped out by a Wailord using fissure three times in a row! Are you freaking kidding me!! I'm still upset about that, and it remains one of the most frustrating things to ever happen to me in video games. Anyway since I can't go back and pick up the pieces in every copy I use to have, I feel like defeating the Battle Subway this time around would help me make amends; and even though I've lost my Pokemon over the years, I haven't lose the desire to win. Only buy old version games to complete Pokedex, for now - I haven't reached the point where I am ready to go buying back all the old games I use to own, and Pokemon is no exception. Even though I would like to own a copy of each game once again, I am not going to drop all that money to obtain it right away, especially if I want to play them. I need to treat old game re-purchases like new ones, and I will detail some of my most favorite games I need to repurchase later, but for now with Pokemon once I've obtained all the Pokemon I could possibly get between my copy of White and Black 2, I will only buy past versions to complete it. Pokemon Dream Radar - Again another thing to help me complete my Pokedex, and only compatible with Gen V. I can only get this though once I've obtained all the Pokemon I can between the two games I own. Wait until Pokemon Bank releases - As of yesterday (1-22-14) Pokemon Bank just came back online in Japan, and we are still waiting to hear when it will be released in the U.S. That could be today, next week, or six months from now. Whenever it does get released, I can confidently buy Pokemon X&Y. I will be able to transfer my completed Pokedex with ease, and then I can focus mainly on playing X&Y and future Pokemon games. Defeat all the Champions in the Champions Tournament at least once - Winning the tourney for the first time last night at 1 a.m. was a huge moment for me. Yeah I lost like 5 times in a row to both Lance and Alder (especially Alder, he's got my number) it was a very rewarding experience for me. It's another page in the history book of my life with Pokemon games. I never get tired of battling the AI, raising my Pokemon and trying to find out what works best for me. I've tried going online but it seems most people are moving onto X&Y, and Nintendo has already pulled the Ranked battling so you can only play in Free Rating. Which is fine, and there is fun to be had there as well, but I get a lot of challenge from the PWT and I learn as much there as I do playing others. Recently I've started showing the original Pokemon cartoons to my girls, and my oldest daughter is getting hooked. She's always seen me play the games on my DS, but now she has the show to put it together and get a sense of the world. Pokemon came out when I was in junior high, so it's great to see basically my five year old self watch the show for the first time. I enjoy the time we spend together watching the show and playing the games and, as silly as it sounds, as much as I want to share my knowledge of games with her as she grows. I know one day when she is old enough, she is going to inherit all my games, or at least the games she wants. And one day soon, when she is able to read, she will want to have her own Pokemon game that she can play with me. Who knows, maybe all the Pokemon I use and train I can give to her so that she can continue what I started and play with her friends. While saving for her college future is way more important than capturing Pokemon, I am excited about the bonds that we will create through these games. If gaming is important to you as much as it is to me, I want you to realize from my story that one day it can all be gone. Sometimes you have no control over it, and sometimes you won't be able to see how it could have been prevented until after it's too late. With my Pokemon collection, it was way too late for me to do anything about it. But now I have the knowledge and experience to move forward, and to ensure something like that doesn't happen again. It does still wound me when I think about it. I hope through my story you can begin to take steps to prevent this. Be smart with your money now, even if you think nothing bad will happen. I didn't think I would ever end up in the financial situation I did, but when it happened I had no savings or means to get through it. If you have a collection of games you treasure dearly, don't ever ever sell it. Keep it as long as you can, and if you do have to part ways with it, I would recommend giving it away to someone you know and trust won't go around and sell it. And if you play Pokemon as much as I do, and have suffered a loss as much as I have or worse, please share and let me know how you overcame or are still coping with it. This journey I am on to right a lot of the wrongs I've unfortunately done or had happen to me with video games, is a long and hard one. But the reward will be greater and worth it, and will make me a better person for it. Instead of living with the weight of this loss for the rest of my life, I am slowly picking the pieces back up and putting it all together. It's the only way to make things better for myself. And with that knowledge, I can teach my daughter the importance of what we hold valuable and what losing something important can feel like. And with that being said, it's also never too late to be a champion. I have 15 years of experience with the franchise. Maybe next time this year, I will be writing about my real life quest to being a Pokemon World Champion contender. For now, I will have to settle for the PWT. Anyway, 2014 is in full swing and it's time to make promises and resolutions! Last year was great for me in my personal life, I pretty much rocked it. I was in a great stage play, got married, went to Disney World for my honeymoon (you read that correctly), went to see my favorite band The Killers in concert, saw the Book of Mormon, saw Macklemore & Ryan Lewis in concert, and solved world hunger. Ok maybe I'm lying about that last one, but there's always 2014! As much as I did last year in my personal life, I didn't do a whole lot gaming related until the last two months. I did buy a new Mac computer at the beginning of the year and added a whole bunch of games to my Steam account, although most of those went unplayed. I did get BioShock Infinite which was my most anticipated game of the year (of the past couple years really) and I played it a ton of times. Then I bought it on Steam at the end of the year as an excuse to play it again (this is actually an example of a bad gaming habit I have that I will address later, but I do love that game). Christmas was especially good to me, the biggest highlight being my new Nintendo 3DS XL Zelda Limited Edition my wife got for me. I'm glad I didn't purchase the 3DS right away. That was a resolution I made to myself a few years ago, where I decided I wouldn't buy a new console when it first launched and I would wait until there were enough games I wanted, along with a nice bundle. 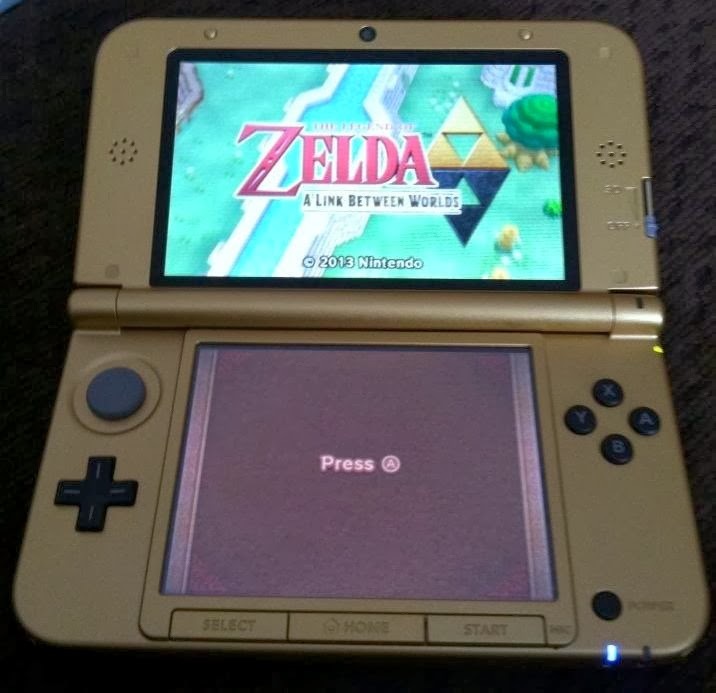 It doesn't get any prettier than this Zelda 3DS, let me tell you. I hear the treasure chest opening music every time I pick it up to play. I made some great game acquisitions in 2013 but a lot of my bad habits persisted, and hopefully in 2014 I will be able to change that. So taking in what I did with games in 2013 (and have been doing since I was five) I created a list of goals I want to achieve for 2014. I believe the purpose of a goal should be that it gives you something to constantly be striving for. I'm going to revisit these goals constantly through the year, and create individual posts for each one to break down the steps I will be taking to accomplish them. So, in no particular order here are my gaming goals of 2014! Spending too much money on games is an issue I've had ever since I was old enough to buy my own games. I became drunk with power when I didn't have to wait until my birthday or Christmas for the next new game from my parents, and started buying games whenever I wanted as much as I wanted because I had all the money now! But in reality, I don't have a lot of money and there are better ways I should spend my money. Most times I shouldn't even spend money and I should save it. I'm not saying it's wrong to spend money on games, but I need to be getting a positive return on what I spend. The main problem is I spend money on games that I don't play. Solution: play those games! That always sounds easier then it is, as anyone with a backlog knows. But I should be smart about my purchases and plan for what I really want this year as opposed to throwing my money at whatever. I will create several posts detailing why I chose this amount, what some of my purchases are and what I am going to do to maximize my budget and make every purchase matter. 2. Complete 90% of my games. Whoa, that's a big percentage number there slow down buddy. 90%? I better get moving that's a lot of games to play. Obviously this is the "cleanse my backlog" entry. However you name it, I have a lot of games I own I need to play. A lot of what I am going to be working on this year is figuring out the most productive ways I can improve how I actually play my games, so that I don't feel guilty of my future purchases and games being left to collect dust (or never being played digitally). A lot is going to be tied into my budget and how and when I buy games. But this is the year I am going to get super serious about completing my games. I know I've said that in the past, but I am more determined than ever to do so. Seriously. I am. Why won't you believe me?!? This is something I've been working on the past two years, so I should have no trouble maintaining it. But I put it here as a reminder not to buy games released right away and to wait for a digital release. I'm going to write a few posts about my decision to transfer my gaming collection to digital and the benefits and disadvantages I've noticed within my own collection. I know that I can't get every game digitally but if it is available as digital, then I must get it as such. My oldest daughter turned five this December, but I put a DS with Nintendogs in her hand at one and a half and she's been playing games ever since. She's getting a lot better every day and she loves it, but what she loves more is playing games with her Dad. And I love it too. It warms my heart. Honestly though, I don't do it as much as I should. I need to take more advantage of the time I do have to play games with her, especially in these winter months. The weather is too rough where we live to drive anywhere or take them out, so what else to do but play games inside! Gaming with your kids is one of the most rewarding experiences as a parent, and I need to do more of it now until she gets older and wants to play Halo 9 with all her friends instead of her uncool Dad who talks about the SNES all day. I mentioned this in yesterday's post, but this year I really want to turn this blog into something special and into what I've always envisioned it to be. I know realistically I won't be able to blog every day. But I need to be working at it daily and not focus on the days I do end up missing, but how much content I actually put onto the site. Who knows hopefully by this time next year I'll have built up a few followers, started a podcast, and I will be proud of all the work I did. So the Xbox One is out and the one thing I'm most disappointed in is I never reached 50,000 gamerscore, and I owned a 360 since launch! I know that gamerscore carries over, and I know I'll never be a Ray Cox but 50,000 is such a nice round number to have. This ties into my number two entry, but I decided to add it because I'm only 10,000 gamerscore away! I need to do it this year! This is the online equivalent to entry seven. Ok, so I never really wanted to be a competitive gamer, but I would be lying I if I said I never wanted to be officially ranked high in a game. Whenever I watch documentaries or read articles online about so and so is the number one ranked Tetris player in the world or so and so is the number 15th ranked Red Dead Redemption player in Switzlerland, I get envious. I want to have a title attached to my name so when I introduce myself to people I can say I'm the rank 45th player for insert game name here. It's a great talking point (for anyone who cares). But still it's something I've never done! I've never really pushed myself to see how good I can get at a game, and challenge myself to rank high enough to be worth mentioning it. Being in top 100 seems like a good place to start, and I'll create a post later detailing what games I have where I want to achieve this. I use to read a lot as a kid. Then something happened around junior high school where I stopped reading books. Last year I read Jane McGonigal's Reality is Broken and really enjoyed it. I would like to get back into reading novels and such; I know there has been a lot of good stuff I've been missing out on. So this year I would like to read some more books, and maybe I should start with some video game books to get me back into it. This is a prime example of how I can hopefully create a positive habit for myself through video games! I think this is a pretty solid list I have to get me through the year. There are a lot of sub lists that can be created from this, fortunately I love making lists! I also love crossing things off lists, which is something I don't do very often. I've been trying to positively reinforce the idea in my head that 2014 is going to be different. This is the year I accomplish (mostly) everything I want to do in my own world of video games. All of these things tackle issues I have that I feel negatively affect my beloved hobby, and the ultimate end goal is that I can create better habits to remedy them. Those habits I form I can apply to not just how I play video games, but how I approach life. This is the year of being a better gamer. This is the year of being a better person. This picture is relevant to the state of being I am in. Also, BioShock Infinite. Two weeks ago I posted a blog that I had written three years ago I never published. It felt good. I have a problem where I tend to sit on unfinished tasks for a very long time, and I'm not only talking about the games in my backlog. I started this blog as a motivation for me to write about video games and other aspects of my life. "Little by little" I kept telling myself, and one day I would hit the point where I'm posting everyday, and my blog is as polished as some of my favorites I follow. So far, I've done nearly nothing with this blog. I've written a lot of content, but much like that last post, I've never put them up. I've stored them away on Blogger, waiting to be edited or to add pictures to them. I've handwritten a bunch of stuff, waiting to be transferred to the digital page. I've created lists of ideas of blog posts, spreadsheets of data I've collected to share, and I've done absolutely nothing with it! "2014 was supposed to be different!" I told myself, but so far nothing's changed. We might be only three weeks in, but I think I have to start being hard on myself and take responsibility for my lack of follow through with this blog. I know that if I really put my all into this, it can be a project I can be proud of. But I will never know unless I commit fully. I know that I set up a lot of road blocks for myself, and I make a lot of excuses. And the only way that's going to change, is if I want it to. So what does this post have to do with video games? Well, my goal for this blog has always been to connect how we play games to how we operate in real life, and how we can better our habits in games to better our habits in the real world. A big goal for me this year is to get my spending under control for video games. By creating a budget and learning how to stick to it with video games, I can apply that knowledge to how I spend my money on other forms of entertainment like movies and books to life essentials like food and clothes. But what has spurred this post specifically is me noticing I'm already falling off the track with the blog, and I've noticed in the past if I start slipping on one thing I said I was totally for sure going to do, it snowballs into other things I totally for sure were going to do as well. If I start slacking on blog entries, I'll start slacking on my game purchases. If I start slacking on my game purchases, I'll start slacking on actually playing my games, etc. It's an endless circle that needs to be unbroken. So this post is just a post of me talking. Me putting it out there that "Hey Jose, I know what you are doing, and I don't like it. You need to get your head in the game and do what you set out to do. Blog post a day? You haven't done anything in two weeks?!? How are you ever going to hit that goal?!? Get moving!!" Well I hear you other voice in my head, but now I have to start listening. I can't just sit on these blog posts anymore, if I want to write something I should write something and just put it up! What am I afraid of? It's not like I have thousands of people reading this everyday...yet. Okay, one blog post a day. That was one of my gaming related goals for this year. It's a tough goal, and realistically I know I won't meet it, but that is what I should be aiming for. Something, anything, a day on this blog. It'll help me be a better writer. It'll help me be a better gamer. It'll help be better at keeping my promises to myself. I wrote this blog post in December 2011, saved it in blogger, and never published it. I am posting it now as it was originally written. How can I become a better gamer? Lately I've been struggling with the question: why do I play video games? My initial response to that is, "for fun". The problem is I am trying to find a response that resonates more with who I am as a person, and is a little more meaningful than "for fun". Not that there is anything wrong with your answer being "for fun". That is the first reason why we all play games. I'm only trying to explore what our other reasons could be, and why it's probably important we know what those reasons are. I've been playing video games since I was a kid, for over twenty years, and I am very passionate about them. And anyone who has been playing games for as long as I have, or even longer, can relate to the fact that you can't play games as much as you use to. Or as much as you would like to. Also nothing impacts your time playing video games as much as having kids. My first daughter was born in December of 2008, and my second daughter was born this past December (again!?) in 2011. Since then every choice I make, action I take, I have done so with their well being and happiness at the forefront of my mind. I've had to make a lot of positive changes in my life to encourage the meaning and purpose they bring to it. Having a wife and kids, a family to call my own, makes me want to become a better person with everything I do. They are my greatest passion, and the first love of my life. Obviously my time with games has lessened since starting a family, but my passion and interest hasn't. Like my love for my family it grows stronger everyday. I'm starting to realize though, video games hasn't been helping me make too many positive changes in my life recently. This worries me because for a long time I have professed to everyone I know how playing video games has always had a positive effect on my life. I contribute my advance reading skills at an early age to Dragon Warrior on the NES. That was the first game I can remember watching my sister play. She was eight years older than me, so she played with the text scrolling speed set to fast. I would ask her to slow down but she would say, "tough cookies" and keep going. I had no choice but to take a bite out of those cookies, and learn to read as fast as she could. For many years in school, I was always reading at a higher grade level because I had to adapt to the fast reading speed and advanced vocabulary of the games I had. Now, back in my day (that's my old man voice) a big part of playing video games was going over to someone's house, so that helped me develop strong friendships and very important social skills through gaming. I learned how to not be a sore loser, to share the controller between single player only games, and to cooperate in two player. As a kid I got along with almost everyone I met. Playing video games in groups of four or more other kids helped me be that person, because I always wanted to make sure we were all having fun within the group, and working together as we played. Video games also helped me explore my creative side at school. A lot of my projects were born from ideas I had while playing games. Many a diorama were built in shoe boxes based on games like Earthbound or Super Mario World. I wrote short stories that were spin-offs of games like Contra or Metal Gear Solid. Surprisingly, the teachers I had never saw me using games for projects or reports as a bad thing. I was always encouraged to use it as a motivator, and got good grades because of it. I could go on forever about how much good video games has been to me when I was younger, but now I'm starting to see some of the bad. I spend way too much money on video games. I buy games that I play once, and then never again. I don't buy bad games, I just buy too many of them. Whenever you invest money into something, there should be some sort of positive return you receive from that investment. Spending sixty dollars on something, only to use once or twice, and then stack it onto a pile of others like it, doesn't sound like a positive return on an investment. Because it isn't. I've also become inconsistent with wanting to sell games I've never played or haven't played in a while. I begin to regret my decision and I repurchase what I tried to get rid of. I've done that constantly, pretty much lying to myself that things will be different this time. Like I'm getting back into a bad relationship with an ex because this time we will make it work. But it doesn't work because I don't finish the majority of my games any more. A lot of my games fall to the wayside because I only have such a small amount of free time to play, and it's just not possible to get to all of them. My social behavior within games has changed as well. I don't play online anymore because I have begun to dismiss anyone else who plays, as a negative person. It's an unfair judgement I make, as if I'm this noble white knight playing games online. It's also not right for me to assume that because of bad experiences I've had online with people using racial slurs or being overly aggressive, that everyone is like that. I'm very quick to jump into an argument and say these people don't represent everyone who plays games, but it's the main reason why I don't communicate with anyone online. I end up grouping all gamers online as being that type of person. It's not fair, and it limits my enjoyment of games that have great online content and communities all because of this paranoia I've developed. I've also become obsessive to a fault with achievements and trying to 100% games, and sometimes I won't play a game because it feels like a chore rather than a rewarding experience. I look at missing achievements or content I've yet to unlock, and get frustrated because I know I might not have the time to complete them. When I was younger, 90% of my time was spent playing games. I had all the time in the world to obtain every item, weapon, and materia in games like Final Fantasy VII. Or collect all the dog tags in Metal Gear Solid 2. Or 101% Donkey Kong Country. So when a game like GTA IV has an achievement that unlocks after finding all 100 pigeons, I get mad that I don't have the time to complete it, so I won't play the game. Somehow I've grown bitter against games that contain goals like that, because it's become much harder for me to obtain them. Like I've forgotten I don't need to do that, I can just play the game for enjoyment or to have a great experience. But yet it keeps me from wanting to play GTA and other games. My bad spending, inconsistent gaming, lack of social interaction, and negative obsessive compulsiveness are all problems I've noticed developing through my gaming and carrying over to how I handle things in my personal life. More importantly, I realize and am fully aware that all these habits are self imposed, and can be fixed. So how do I do that exactly...do I give up gaming? Nay, I say, I shall game some more! Like I said before gaming has had a very positive effect on my life, which is why I'm so passionate. I'm at a turning point now, because some ugly things I don't really like about myself stem from my bad behavior. I need to correct that behavior, therefore I have to change how I game. I think also more importantly, why I game. It's to have fun yes, but I think the reason why I want more from gaming is because it has had such a huge affect on me. Now is the time I stop treating it as just a fun hobby, and start treating it as a very important part of who I am. I want to make gaming matter to me; because it does and I want to make healthy choices that improve and maintain my relationship so that it can endure through the years. I want to be a better gamer, so that I can be a better person. Just how having kids and a family has made me look within myself and fix the things I felt could have a negative impact on my life, games can have the same positive benefits. That is why I created this blog, to chronicle the journey of me trying to be a better gamer. Hopefully this will open up a dialogue between me and whoever is reading this, so that we can talk about how gaming and the habits we develop from it can be a very positive thing and help us grow and be happy in the real world. As much fun as we have playing games, we should be having in real life. So, how do you become a better gamer? Let's find out together. 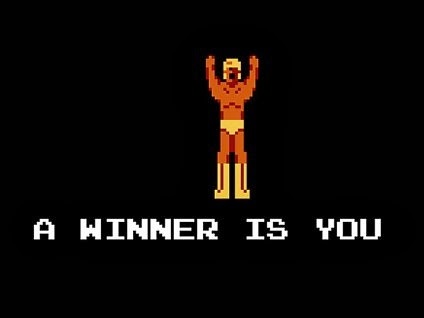 Question for the reader: What is your response when someone asks you, "How do you become a better gamer?"